Small business constitutes slightly more than half the U.S. economy. According to YourEconomy.org, 88% of all jobs in Oregon are in small businesses (that is, with fewer than 500 employees)—and a third of all jobs are in businesses with 9 employees or fewer. Communities with a density of small business have higher per capita job-growth rates. A 2010 study in the Harvard Business Review revealed: “Our research shows that regional economic growth is highly correlated with the presence of many small, entrepreneurial employers—not a few big ones.” Throughout the recession years, Oregon firms with 1-4 employees were the only sector with positive job growth. Despite the current era of globalization, small businesses have remained competitive vis-à-vis larger businesses. The percentage of jobs in the U.S. economy that are in businesses with fewer than 500 employees has changed hardly at all over the past twenty years. Global trends will probably make small businesses more competitive in the years ahead. For example, all developed countries are shifting from consumption of goods to consumption of services, where local businesses have a clear competitive advantage. The continued competitiveness of small business is remarkable, because government subsidies are almost entirely enjoyed by larger business. Think about it: Most subsidies are for big oil, big electricity generators, big agriculture, big cattle, and so forth. Among those subsidies that typically favor large business are those doled out by economic-development agencies. According to recent studies done by Good Jobs First, subsidies to “attract or retain” businesses go almost exclusive to large, globe-hopping companies. 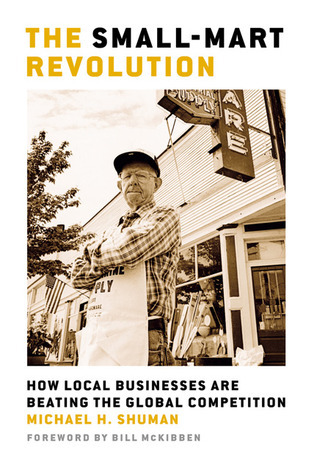 In recent years, Oregon has refocused its attention on retention of existing businesses, recognizing that it is far less expensive to help local firms who have built-in loyalty to their community. Small businesses are more profitable than large businesses. The most recent tax data available from the Internal Revenue Service show that in 2008, net revenue from sole proprietors, which most small businesses either are or start out as, generated eleven times more net revenue per sales dollar than C-Corporations. The probability of a small business receiving a dollar from an angel investor or VC fund is less than one in a hundred (possibly smaller than one in a thousand). This is why small businesses need new state laws to provide new sources of capital. Want to learn more about Michael Shuman’s work?